After the huge output of nice quality fadens from Pakistan and Afghanistan (Kuar Valley in Afghanistan and Dara Ismael Khan District, S. Waziristan, Pakistan), I had the opportunity to look closely at thousands of specimens. The more specimens I looked at, the less I'm convinced that they form in moving fractures by repeated cracking of the crystal. Does someone have an alternative explanation of the phenomenon? This is the official explanation. 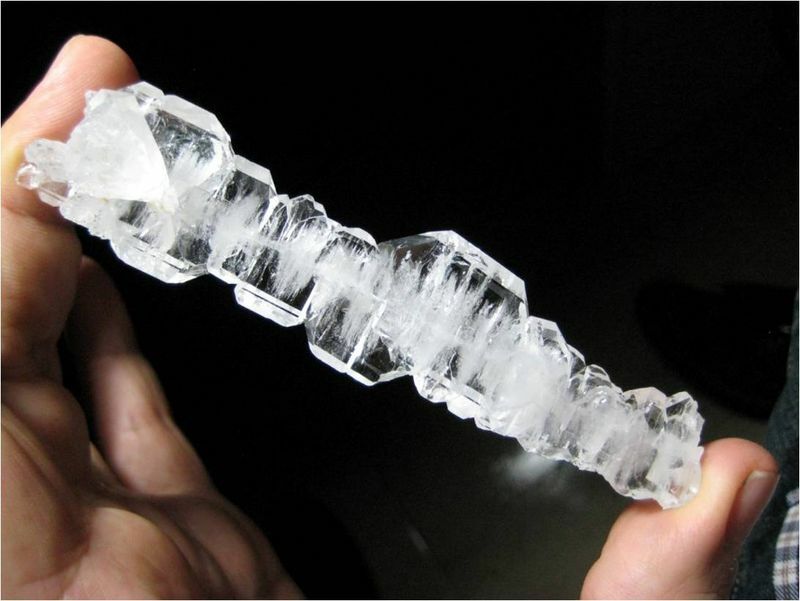 Mindat says: "Faden quartz: Crystals and crystal aggregates with a white thread running through the crystals. The thread is caused by repetitive cracking of the crystal during growth and consists of fluid inclusions. Quartz crystals inside the host rock will rupture when the fissure opens. In a silica rich solution, this rupture will heal quickly, forming a crystal that is attached to the opposing rock walls and bridges the new opening. While the fissure continues to open steadily, the crystal will also continue to crack and heal. 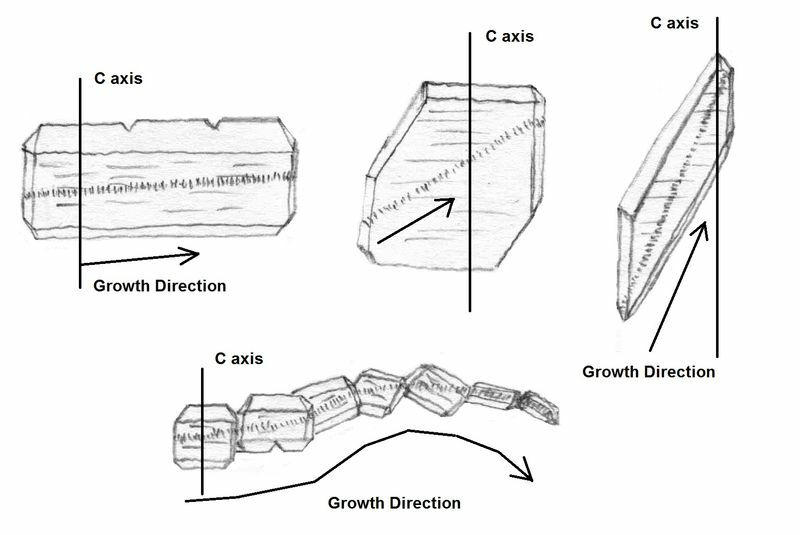 Because growth is much quicker on fractured surfaces than on regular faces and because it leads to small regular faces on the opposite conchoidal fracture surfaces that do not perfectly match, some of the growth solution is included in the crystal. The repeated rupturing and healing leaves a scar of liquid and gas inclusions in the crystal: a white thread, the "faden". In rare cases, the faden is covered by chlorite, which demonstrates beautifully that a now platy specimen did indeed start as a thin thread." I tried to make a diagram of the different cases. The "thread" is a cloudy elongated area that represents the direction of growth of the crystal or crystals. Crystals can be fused into one distorted crystal or many crystals can be juxtaposed one beside the other along the same "thread" line. As in the diagram, we can have different situations depending on the orientation of the "thread" inside the crystal. Thread line can be near horizontal, perpendicular to the C axis or more inclined almost near parallel to the C axis. 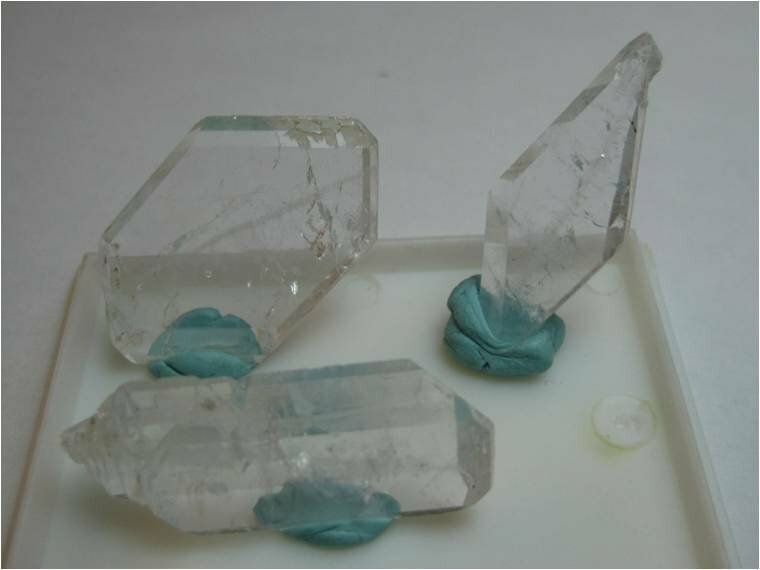 In the first case the quartz crystal will be flat shaped, in the second case the crystal will be distorted as is showed in the diagram. Some crystals have such a strange shape that it is quite difficult to recognize them as quartz. The best way to orientate the crystal is to recognize the six-sided prism that has a typical horizontal striation. It is very common that many crystals are juxtaposed along the same thread line. In this case the crystals are often slightly turned in respect to the previous one. This behavior is similar to Gwindels, but Gwindels do not have the white thread inside. In the official theory, a precursor faden crystal has to touch both sides of a rock fracture, making a bridge. 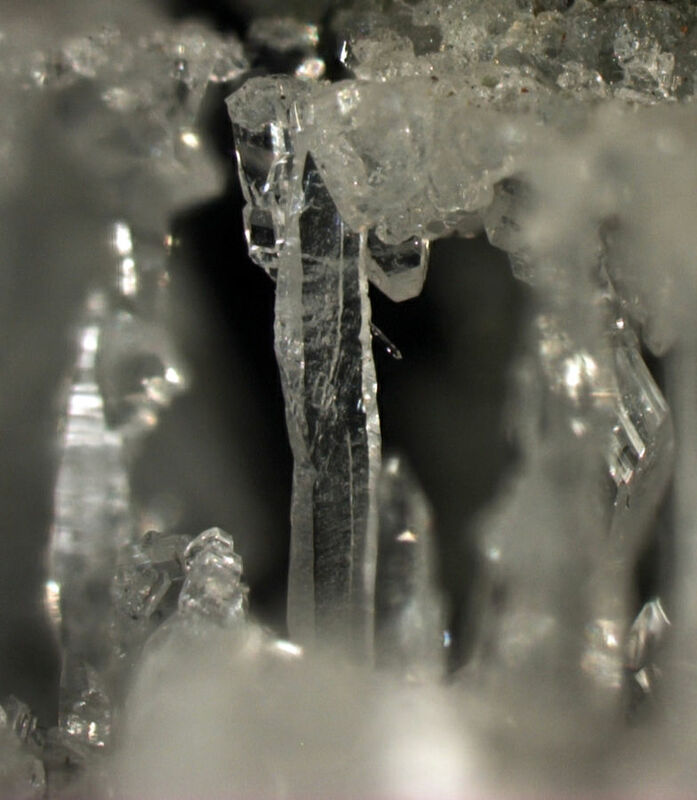 As the fracture moves, the crystal is broken and the bridge is sealed by new quartz molecules. Why is there no symmetry in the crystals as in most fracture related phenomena? How can they grow so perfect clear crystals showing a mono-crystal distorted shape as in the diagram? How can they look terminated? How is the torsion of multiple crystal fadens explained? 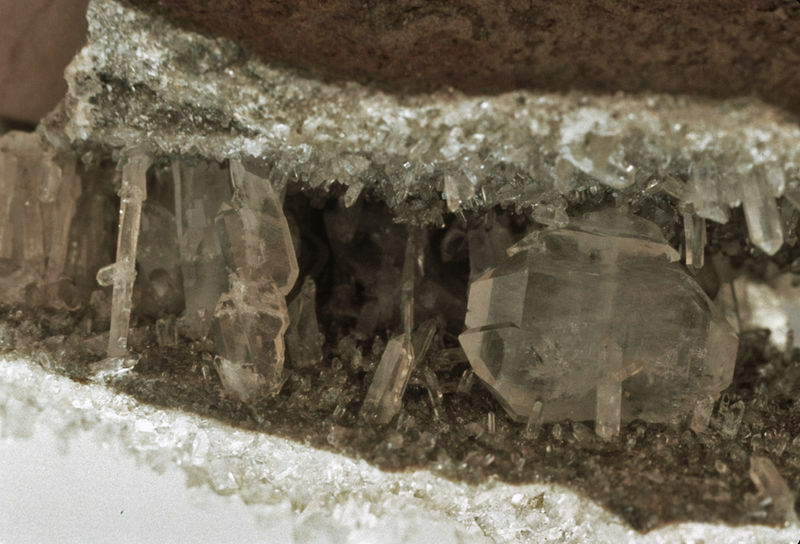 Having written a fairly important paper on faden quartz years ago in Mineralogical Record, I am probably biased, but let me make a few comments anyway. 1. I have collected examples of alpine veins with multiple quartz needles oriented perpendicular to the vein walls, in some cases spanning the vein and in others failing to do so - but with a matching needle on the other side. These have minimal overgrowths. I think they demonstrate the process "frozen" in place, and show that the explanation is valid, at least sometimes. 2. I have seen some quartz with white thread-like structures inside that I do not believe were faden. The environment is wrong, and the threads lack the characteristic banded fluid inclusion microstructure of typical faden. I think these threads were chalcedony of some sort that got overgrown, but I am not certain of that. This shows that not all quartz with white lines is typical faden quartz. 3. The frequency of smooth overgrowths (e.g. Marco's first photo) vs. multi-crystal ones (his third photo) seems to vary from locality to locality. I suspect it has to do with details of nucleation of the overgrowth and perhaps with slight misfits within certain faden themselves, and provides interest but not much deep meaning. 4. In my experience, curved faden are uncommon, and when the do occur, the curve is always a gentle arc. I have never seen a curved faden as complicated as Marco's bottom drawing, and if it is based on a real specimen, that would be an exceptional specimen! To be clear, I am not saying that such crystals do not exist, only that they are very unusual and I have not seen them. 5. Though the classic model separates the period of faden development from the period of overgrowth with clear quartz, this separation may not be an absolute one. I think Marco's third photo shows a crystal with many fractures part-way through the development of the clear overgrowth, as shown by many wider healed cracks more or less perpendicular to the central faden. I suppose the extreme of this would be frequent cracking throughout the growth history. This would probably lead to a very weak crystal with a low probability of surviving long enough to be found intact. 6. One might expect that the frequency of differently oriented fadens could be related to the difference in growth rates in different directions in quartz. Faden oriented such that the direction of growth needed to close the gap was a slow one would have a lower probability of surviving the faden formation process than those with a faster growth direction. On the other hand, this might be a subtle distinction compared to the actual process, which might be slow enough that breaks in any direction have time to heal, or fast enough that breaks in any direction do NOT have time to heal (in which case there is no faden). I don't know of any evidence that bears on this possibility. 7. 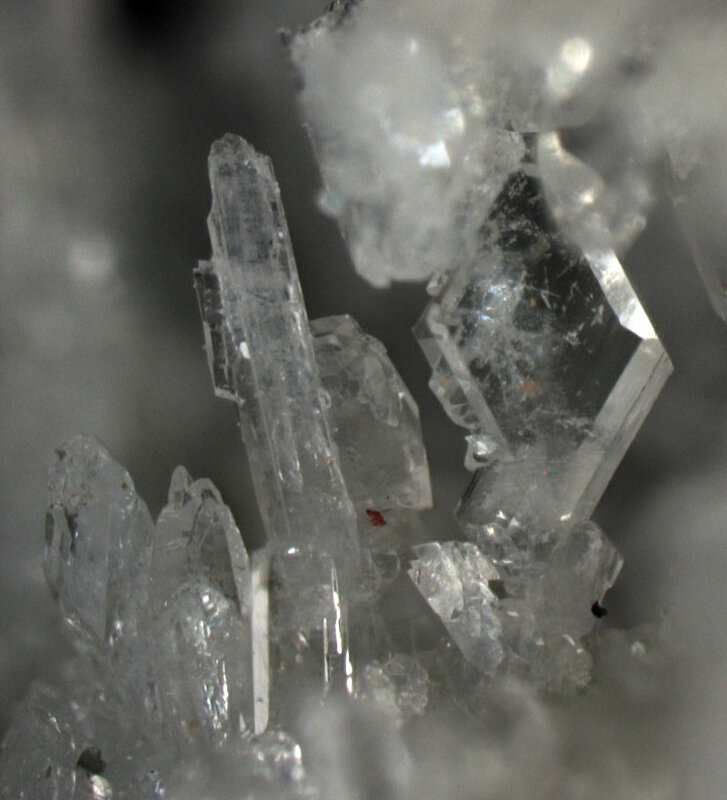 Faden crystals of many other minerals are known, especially from alpine environments. These include adularia, epidote and relatives, dravite, grossular, probably hematite (hard to evaluate! ), and probably a number of others that don't come immediately to mind. What a fantastic thread Marco! me too, thanks everyone for an amazing conversation! Merry Christmas! The english version of this article will appear next month in the next issue of Mineral Up magazine. I have nothing to add to the discussion but want to share a photo of a faden quartz that I was lucky enough to find. It is a very rare matrix piece with a busy termination that does not appear to ever have been attached to an opposite wall. The locality given is Waziristan, Northwest Frontier Province, Pakistan, and it is 6 cm high. A photo taken by Jimmy MacNeil of one of the many faden quartzes he and Hisami mined from the Stand-on-your-Head claim in Arkansas. It shows evidence of movement of the widening fissure during growth, or rather one faden is younger than the other and direction of fissure widening changed? Or perhaps one of the crystals just broke of the wall and rotated as it fell into a new position - probably more likely. John's "terminated" faden I'd interpret as one where the "thread" broke because the fissure was widening faster than the quartz was growing, which must have been a common circumstance. Hi Pete, thanks for your deep reply. But despite your strong preparation, I continue to have more questions than answers. Waiting for the paper of Jesús Fraile and Miguel Calvo, I retouched the diagram and I want to pose more questions. I add to the diagram the case of single crystal faden with angle C-T near to 0 (C axis-Thread). This is rarely collected because in appearance it is not a faden. 1-Why the movement of the fracture cause the rupture of the quartz crystal instead the rupture at the contact with the host rock? This is the weak point and anyone that have dug for quartz knows it. 2-Why the remains of the repeated fractures have all the same size and they are all parallel each other? You can imagine that a crystal broke twice in the same point? And repeat it hundred of times? And why parallel? Is like to win the lottery hundred of time with the same number? 3-I don't understand why the fresh fracture would be more suitable for overgrowth? 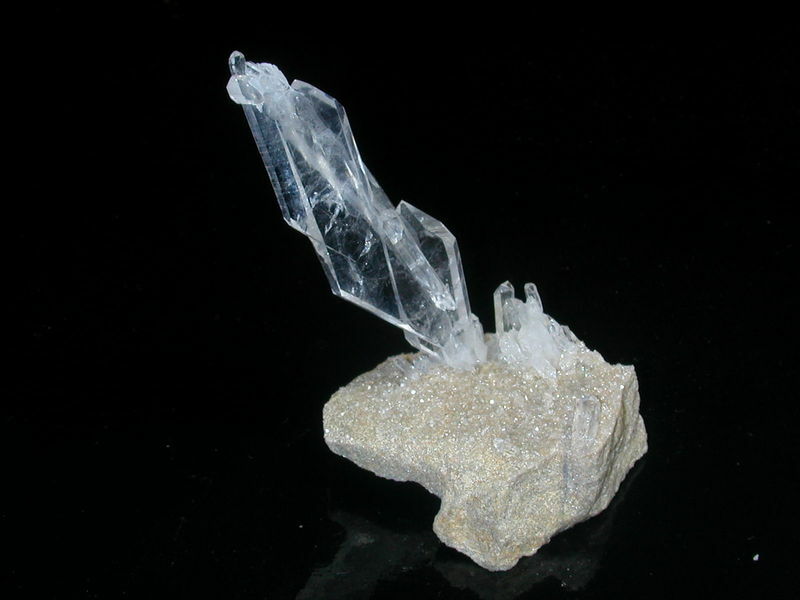 Is common the case in which a fracture in a quartz crystal is overgrown on both side, but is not sealed and still remain an open fracture with two recrystallized quartz crystals. 4-Why we have no evidences of the inner fracture of the crystal, the last one? Almost one long fracture crossing the whole crystal, never! 5-Why the fractures of the crystal never reaches the surface of the crystal and they are confined to the core of the crystal? 6-Despite the angle between the "thread" and the C axis can vary from 90 to 0, the "thread" lies always in the middle. Why? 7-All alpine fissures move, but faden are still rare, why? Numerous crystals are found touching with their top point at the wallrock without being fades. 8-Fibrous quartz filling rock fractures is quite common and is formed in opening fractures by the same fracture-migration-process that is supposed to be responsible for the faden formation. Why in some case we have fibrous quartz and in other faden crystals? 9-There are too many curves in the faden "thread". Plate tectonic is quite straight phenomenon and its curves have an other scale. So I expect the threads to be straight. 10-Can we have some relation between fadens and gwindels? 11-Pete think there are almost two phenomena responsible for the formation of faden (its point 2)? A convergent evolution? 12-You said that mono-crystals are the result of overgrow? And multi-crystal are associated with high nucleation of the overgrowth? If you broke a single crystal during the fracture-migration-process you continue to have a single crystal. So over what they overgrow? 13-Why many fadens are well terminated? Multicrystals are much more common than single crystals fadens. And between the single crystals, the more common are the intermediate angles, while near 0 and near 90 are quite more rare. This is what I will expect from a random relation. I never found a real 0 or a real 90. My impression is that the fracture-migration-process theory, despite theoretically possible, it is not likely to be responsible of the genesis of faden crystals. I expect a quite different result from that process. The event of broke and seal a crystal is a rare phenomenon and I guess it would very difficult to repeat it more than few times in a single crystal and never in a so constant and repetitive way. Fractures must to run randomly. In my opinion the process must to be in relation to the overgrow of quartz along a preexisting thread. I have no idea of what kind of thread, but a chalcedony thread often covered by chlorite can be a good candidate. In an agate geode this is a common situation with chalcedony thread crossing the cavity and pending from the roof. The presence of chlorite family minerals is also common giving as a result moss agates. Similar situations are often found without the agate filling of the cavity, for example in the basaltic geodes from India where chalcedony is often found at the core of quartz stalactites or other zeolites. The bubbles in the thread can be the result of loss of water from the chalcedony. The overgrow of quartz over a chalcedony thread would explain in my opinion much better the different structures found in faden crystals. This will also be correct in case of faden made by epidote, adularia and also gypsum. Doesn't matter which mineral overgrow the thread, it will always make a faden crystal. You raise many questions, and I cannot answer all of them, nor do I want to discuss each point over many "pages". In spite of that, I appreciate the extent to which you have obviously thought about the phenomenon of faden quartz. Many of your questions are "why" questions. I suggest that we are involved in trying to understand and describe in detail a mineralogical phenomenon. Whether or not we can say WHY it happened in every detail, it still happened, and our job is to try to understand it as completely as possible. My reading of the evidence I have seen is that faden quartz development is basically a two-step process - formation of the faden followed by its overgrowth. Faden must span the vein in which they occur, otherwise they stop growing (and this happens frequently, apparently) but still remain available to be a seed for quartz overgrowth. We rarely see faden crystals in place, so specimens like John's are really valuable evidence. Although faden crystals are rare overall, they are common and even typical in certain very specific places, typically in alpine vein environments. But only in specific alpine vein localities where the delicate balance of conditions was realized to allow them to form. 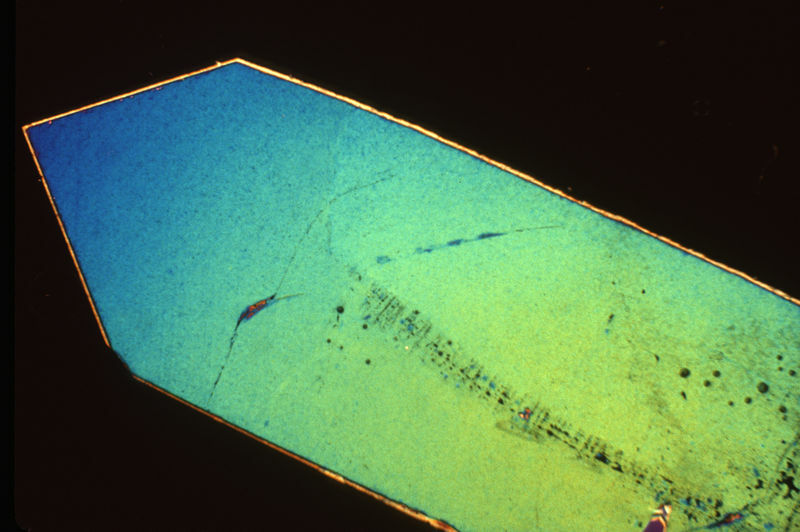 Ultimately, the way to evaluate these two alternative explanations is to look in detail at the resulting crystals, by means of thin sections examined microscopically (which was done in my work). Chalcedony has a very different appearance in thin sections examined in polarized light than does a (single crystal) faden. Not everyone has the equipment to do so, but one could have a first look with a normal binocular microscope and two sheets of polaroid plastic, one above and one below a faden crystal, and with illumination from below. I encourage you to find the opportunity to do so, and to share your findings. I attach two images of faden quartz that I think are quite informative. A single crystal with faden, viewed under cross-polarized light. The uniform color between the faden region and the surrounding crystal shows that they are in the same crystallographic orientation. The color changes from one end to the other because the thickness of the section changes. Walter Böniger collection (in 1990). Several faden crystals spanning their vein. Different faden orientations lead to different crystal shapes. Not all crystal are faden crystals, but those that are have parallel faden, or nearly so. Hi Pete, thanks for your deep reply. This is a rather different question and deserves a separate answer. Mine is that there is no relationship between fadens and gwindels, except that both are unusual forms of quartz crystals. - Gwindels lack the faden that defines faden crystals. 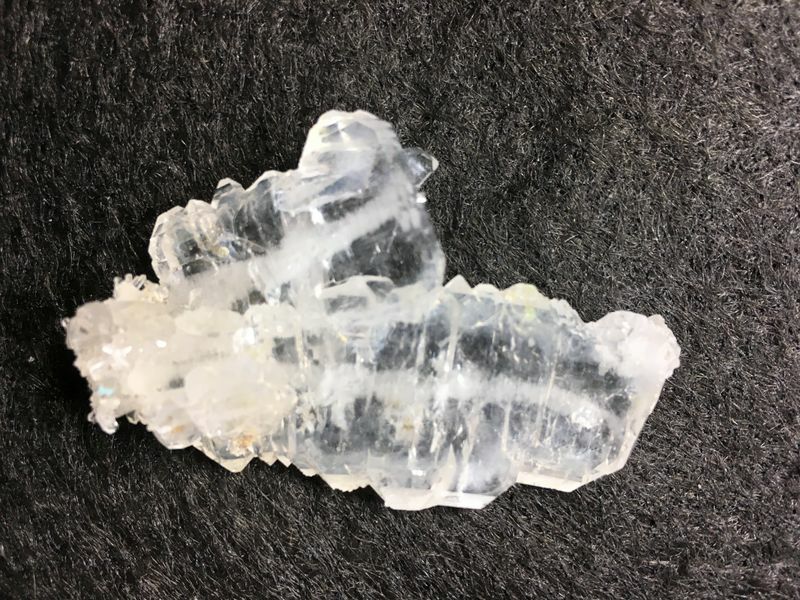 - Faden crystals rarely twist, but gwindels are systematically and continuously twisted and the amount of the twist is related to the dimensions of the crystal. A final comment: here are some images of a "baby" faden vein from Quebec. The vein is only 5 mm tall, so no large faden crystals can be expected! But this illustrates the completion of some faden and their overgrowths from one side of the vein to the other, and the failure of others to keep up with the process. Food for thought. Small vein with faden quartz crystals some of which span the vein and some of which do not. WOW! Those are nice specimens. More geologically than aesthetic, but for me are real treasures!! I'm happy Pete you are so involved in the theme. I just want to clarify my appreciation to your experience and nothing personal in the discussion. Talk is the best way to understand. I don't have an answer and I have nothing against your theory, just that it does not convince me. Not yet. My way to look for the truth is to pose all the reasons "why" I can and then try to find the those responsible for the crime. The genetic hypothesis must answer How it can be formed and Why is not formed in other way. We can say they can form by the fracture-migration-process or by the landing of extraterrestrial collectors, but only the truth can answer to all the "why?". I tried to draw a step by step diagram of the fracture-migration-process and it is not running. 1- In step 2 I don't believe the quartz will break in this way, in the middle and parallel to the fracture. 2- In step 3 I don't believe the sealed fracture leave remains only in a small portion in the core of the crystal. 3- I don't believe the steps 1-2-3 can be repeated hundreds of times without variation, fractures parallel each other and with bubble line with the same extension. From your superdidactic specimens I just can see that many crystals are touching both sides of the fracture, but we are far from demonstrating that they are formed during wallrock movement. The same I can expect if they were overgrown over a preexisting thread making a bridge in the fissure. Why the fadens are not parallel to each other as happens in fibrous quartz vein filling or for example in tiger eye? From the polarized section I can see that the the thread is clearly curved and this is not as predicted by the fracture-migration-process theory. The idea of chalcedony is just a working hypothesis, can be anything. Just chalcedony often produces filaments and is composed of quartz. But I'm still convinced that faden crystals grows over something. Talk is the best way to understand. Talk is a good way to understand, pictures are an excellent help! Yours communicate your ideas quite well! Your concept differs from mine in ways that may help to explain why we disagree. I do not visualize a quartz crystal spanning the vein as you have drawn, and then breaking and healing with just the middle having bubbles. I agree that such a model has many issues. I imagine that the starting point for the faden - the thread - is a grain of quartz that is part of the matrix, and that is broken when the rock cracks at the beginning of opening into a vein. It may seem unlikely that such a grain would break instead of coming free from one side or the other, and indeed detachment may happen some times rather than fracture. In that case there is no faden. But if the grain does break, it is likely to break in a direction more or less perpendicular to the stress being put on it, as shown by your arrows. The crack then heals, leaving some bubbles behind. Then the grain breaks again, not necessarily in the same place, but probably with a similar orientation because the direction of the stress is the same. This goes on until the faden - the thread - is developed. There is as yet no crystal surrounding it. Why does no quartz grow on the side of the faden but only in the crack. I cannot say, but I can suggest that the outside of the thread is a less clean surface than the new crack, and so less conducive for new crystal growth. At this stage we have a thread with a series of healed cracks and with bubble trails that go basically all the way across. Then the overgrowth of quartz starts, and the full faden crystal develops. Again I cannot say why this happens, but without it one does not get a full faden crystal. There are abundant examples of minerals that grew, stopped growing, and started again, but only in a few spots because the rest of the surface was somehow an inappropriate substrate. This is why the crack is only in the middle of the final crystal, and why the crystal is more or less uniformly developed around it. The crystal's form is a result of growth starting along a line rather than at a spot, interacting with the natural shape of the crystal. You mention fibrous quartz vein fillings. I have never had a good specimen of this, but I would say (and this is not my idea) that these are (or can be) a dense aggregate of fadens - threads - formed by the same mechanism, but with the threads all packed in together, as might happen with a vein in sandstone or quartzite, and no room remaining for later overgrowths to develop any distinctive morphology. If so, they should also have the distinctive bubble "ladders" in each fiber. You ask why the faden are not parallel. Generally speaking, they are parallel most of the time. On some other "intact" specimens I have, they stick up essentially perpendicular to the surface and parallel to each other like the bristles of a brush, but here and there one has broken off and tipped over, now cemented at an angle or lying on the matrix. I suspect that in some veins most of the faden develop into complete faden crystals after being detached and falling to the bottom of the vein, in which case they would be like straws, certainly not parallel to each other but perhaps tending to all be parallel to a common plane. And the resulting faden crystals would probably intergrow and be very difficult to recognize! In the polarized light image, you are quite right that the faden is curved. Interestingly, the enclosing crystal is not. In fact, the uniform color shows that the faden's crystal lattice is NOT curved, even though the faden is. How can this happen. It seems improbable, and indeed is not typical, but it would seem to require that the faden development involved some shearing movement as well as a straight separation. If the extra movement were rotational, the crystal structure of the faden would have been rotated as well. Possibly the amount of curve in the structure would be too small to be detected optically - I am not sure. Faden crystals form a highly coherent group characterized by the faden, which macroscopically looks like an opaque or translucent thread and microscopically contains the distinctive train of bubble inclusions, as I suggested like the steps of a ladder. This is so completely so that it becomes a tautology - that's what defines a faden crystal and if it lacks this feature (including the details of the structure) it's not a faden crystal. Fair or not, I think it is true. 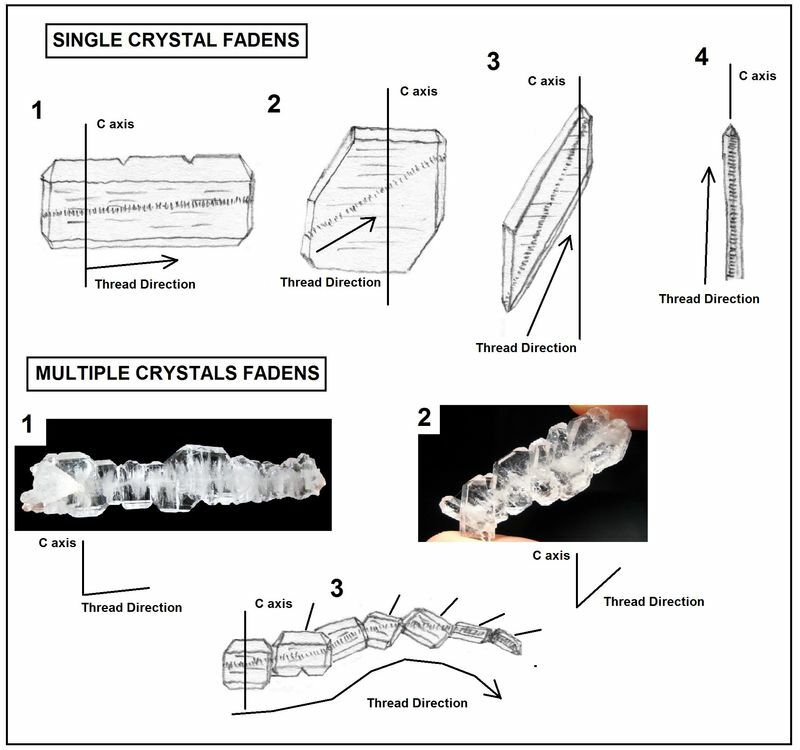 Certainly there are other examples of crystals with interior linear features, and in some cases there is even a clear crystallographic relationship between the interior linear feature and the distorted morphology of the overall crystal, but I would not be inclined to call them faden crystals because doing so implies all kinds of additional information that is true of "real" faden crystals but not of these "pseudo-faden" crystals. But if we are speaking of what we generally mean when we talk about or show pictures of typical faden crystals, alternative theories of origin must account not only for the thread and its crystallographic relationship to the overgrowing mineral, but for the trains of bubbles (two-phase inclusions, in fact) as well. A final comment that I take seriously, and offer respectfully: Mark Twain once said, essentially, "Geology is a wonderful science. One gets such a wealth of conjecture from so few facts!" I have often said that a good geologist can come up with 10 hypotheses to explain something that needs no explanation! And the corollary is that a good geologist can come up with a dozen reasons to doubt almost anything. Look at how long it took before continental drift stopped being nonsense! There's so much that we cannot know for sure! 2-you overgrow the faden by a deformed quartz crystal. In this case why the thread have traces of the fractures? A tiny crystal could repair easy completely. Why the overgrown crystal is always deformed? 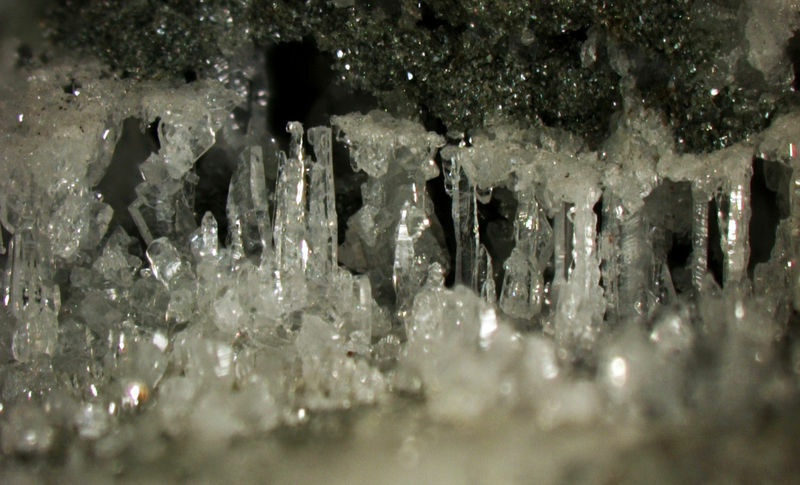 Deformation of the crystals means that they are formed in an unusual environment. But if the unusual situation responsible for the formation of the thread is ended at the moment of the overgrowth, there is no reason for the crystals to be always deformed, flat or distorted. 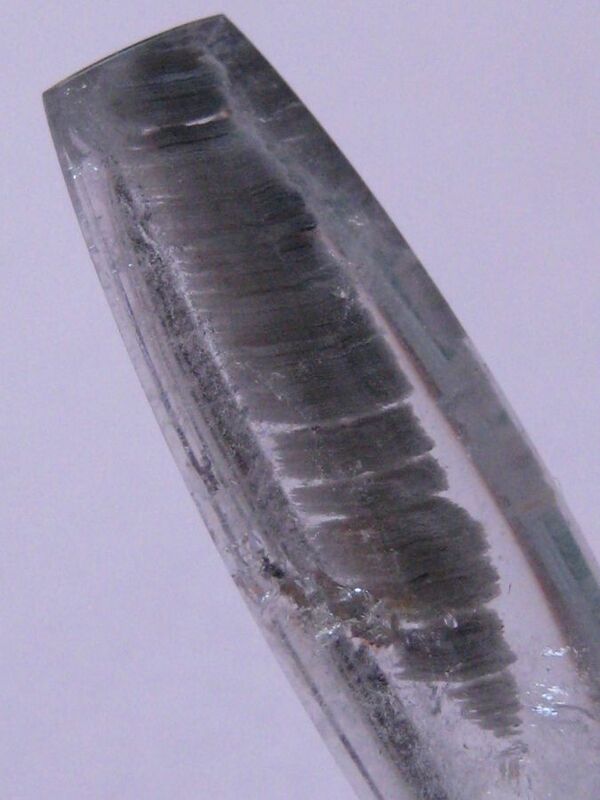 In some case would be possible to have a normal quartz crystal with a faden thread inside, but this never happens. Now I want to try to think outside the box. Leaving aside the quartz and think about the fracture movement. A fracture is the result of a stress release. Rocks are elastic at a geological scale. They support some stress, but when the stress exceed a threshold, there is rupture and an earthquake. Strongest the earthquake, more important the fracture. Some earthquake are generated along few km long faults, other smaller just few cm long. But because of the elastic nature of the rocks, these fractures can not be indefinitely smaller. 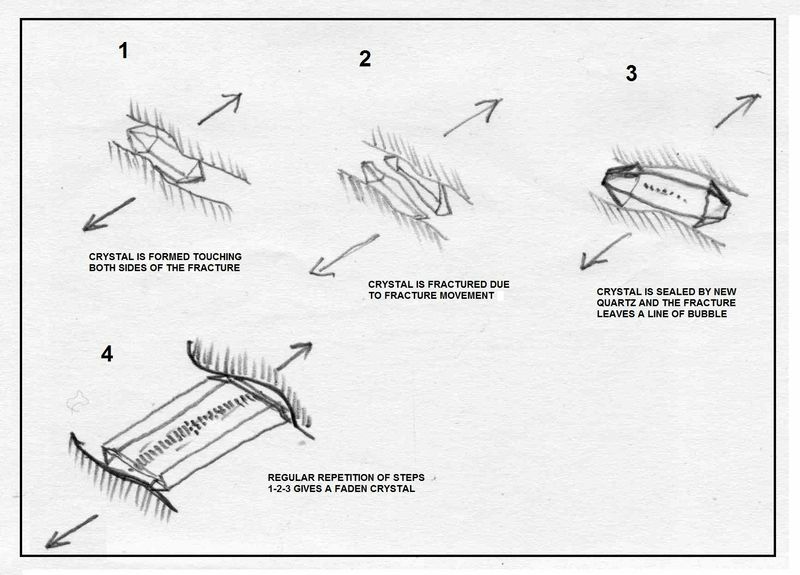 In other words, the elastic energy accumulated prevent the formation of very small fractures. In the fracture-migration-faden model, there is the assumption that microfaults can be very very small, in the order of few fractures for mm. The single quartz crystal is not elastic, so it behaves as a fragile material and breaks at any minor movement. But this is not true for the wallrock containing the alpine fissure. A geologic mass of gneiss support an important quantity of stress and the release of this stress is responsible for the formation of the alpine fissures, but the growing of the fissure is made in a few steps or just in one single event, but is not a continuum. Alpine Fissure-type veins are concentrated on folds in gneiss or granite and are a relatively surficial phenomenon. Deeper in the crust where rock behaviour is more ductile, the fissures are rapidly filled, forming pegmatites or quartz veins. I suspect this is the end of the fracture-migration theory. R.I.P. Moved this fantastic thread to the Featured Columns of FMF section. Why the thread have traces of the fractures? A tiny crystal could repair easy completely. A geologic mass of gneiss support an important quantity of stress and the release of this stress is responsible for the formation of the alpine fissures, but the growing of the fissure is made in a few steps or just in one single event, but is not a continuum. (1) A tiny crystal might repair easily and completely, but it is also easy for a fractured crystal to heal with enough irregularity to trap fluids within the healed surface. At the scale of these bubble inclusions, the faden is not tiny, but is perhaps 10 to 30 times the diameter of the trapped fluid inclusions. Such bubble inclusions are extremely common wherever crystals have cracked and healed. Incidentally, these inclusions are typically now filled with gas plus liquid, often plus one or more crystals. When heated enough, these combine into a single fluid that is taken to be identical to the (single-phase) fluid that was originally trapped. Such studies show that the inclusions formed - and therefore the faden was growing - at temperatures in the range of 300°C and under considerable pressure. (2) The overgrowth crystals are distorted because they are nucleating along a linear, single crystal seed - the faden. This constitutes an “unusual environment”. They grow oriented in whatever direction the faden has, crystallographically, and typically this will not be one with a simple relationship to the crystallographic axes. This aspect of influenced crystal growth is observed in many different situations, not only in faden crystals. 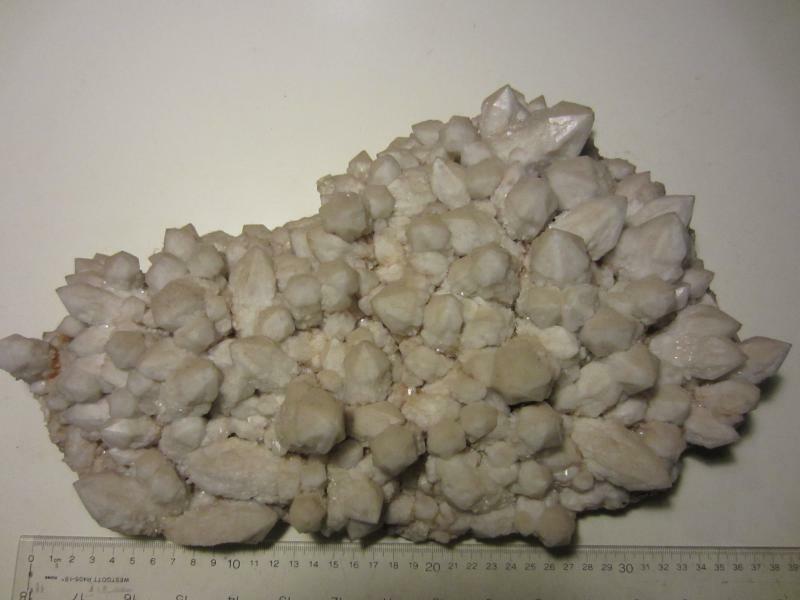 The calcite I showed in the other recent thread is but one example, though it is a magnificent one. Faden quartz crystals CAN form with the faden parallel to the c axis, though this orientation would not be any more probable than any other. When this happens, the crystals have pretty much a “normal” habit, though they will be elongated more than a crystal grown in the same environment but not on a faden. I have seen a few such crystals. They are rare because any appreciable deviation of the faden from parallel to the c-axis will lead to some discernible distortion of the resultant faden crystal. 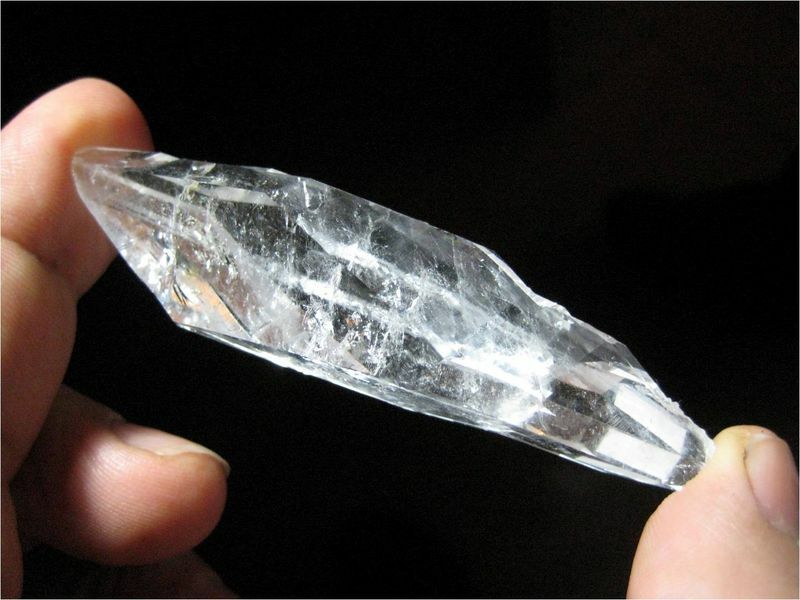 If a faden crystal could continue to grow freely - without running into other crystals or the vein walls - to a dimension of, say, several feet, it would gradually assume a normal shape, because the distortion caused by nucleation along the faden would become negligible compared to the size of the overall crystal. (3) It is good to consider the geological conditions in which these crystals and their veins develop. I am not a geophysicist by any means. But I agree that the scenario you propose would not lead to faden development. However, my reading shows that others believe in a different mode for vein formation. Based on these writings, I believe your model for vein formation is the wrong one, one that would be appropriate for large-scale tectonics and basically at surface pressures and temperatures, where rocks are brittle. Several recent papers about alpine veins speak of microfracturing driven by hydrostatic pressures at elevated temperature and moderate depth, in a quiescent tectonic setting, under conditions where the rock is not ductile but not as rigid as at surface conditions. These are exactly the conditions that allow the development of faden. References are provided. I should say that I am not alone in supporting the “crack-seal” hypothesis of faden development. I worked out the ideas myself while studying faden quartz I collected in Quebec, but then found that the basic ideas had been advanced in Russian in 1946, when I was 3 years old! The same paper was published in German translation in 1972. A more general treatment of fibrous crystals and rock deformation was advanced by Ramsay in 1980, and included in a textbook in the early 1980s. Perhaps my main contribution was providing a statement of these ideas in English. The fact is that this idea has stood the test of time, and has become part of the standard model for Alpine vein mineralization. It has been accepted, hopefully with appropriate critical thought, by professionals in a number of related fields, and the basic ideas have been independently worked out at least twice. The “fracture-migration” hypothesis is alive and well! Laemmlein, G.G. 1946. [On the origin of flat crystals with "white streaks”. Originally published in Russian in [Questions of Mineralogy, Geochemistry, and Petrography], Russian Academy of Science. Republished in 1972 in German translation (by B. Sta1der-Scherrer) with French summary. Stalder·Scherrer, B. 1972. Über die Entstehung flacher Kristalle mit "weissen Streifen" [On the origin of flat crystals with white streaks]. Schweizer Strahler, 2,430-440. Rykart, R. 1977. Zum Wachstum plattiger Quarze mit "Faden”. [On the growth of tabular quartz with faden]. Schweizer Strahler, 4, 209-221. Ramsay, J.G. 1980. The crack-seal mechanism of rock deformation. Nature 284, 135-139. Ramsay, J. G., and Huber, M.I. 1987. The Techniques of Modern Structural Geology. Volume 2: Folds and Fractures. Academic Press, London, 391 pages. See particularly Session 25. Richards, R.P. 1990. The origin of Fadenquartz. Mineralogical Record 21: 191-201. Wagner, T. and Cook, N.J. 2000. Late-orogenic alpine-type (apatite)-quartz fissure vein mineralization in the Rheinisches Schiefergebirge, NW Germany: mineralogy, formation conditions and lateral-secretionary origin. Mineralogical Magazine 64(3): 539-560. Cesare, B., Poletti, E., Bioron, M-C., and Cathelinea, M. 2001. Alpine metamorphism and veining in the Zentralgneis Complex of the SW Tauern Window: a model of fluid-rock interactions based on fluid inclusions. Tectonophysics 336: 121-136. Akhavan, A. (2012). The quartz page. https://www.quartzpage.de/about.html, accessed December 23, 2016. In any case, I learned a lot during this discussion and I hope more peoples add to the thread (double meaning joke!!). I'm still convinced that quartz faden crystals grows over a preexisting thread, that is the second part of your two step model. So we can say that we are 50% in agreement. I have no idea what is the preexisting thread and I don't have my own theory, but I'm sure more investigation is necessary to clarify the mechanism, also in the case you are right. In your thin section cross-polarized picture it is possible to observe 2 trends in the thread. One is many short lines perpendicular to the thread. The second is perpendicular to the first and consists in few lines along the thread direction. While the first are the supposed fractures, the second can be a relict of the preexisting thread. Veil inclusions in crystals composed of many little voids with water are a common feature and are formed in a variety of ways, between others fractures, growing defeats or pseudomorphose after some preexisting material. Between all, the only one I think can not be finely repeated is the case of a fracture. A pseudomorphose could be an alternative. Just as an example I want to show you something. The picture 1 show a quartz with a strange inclusion. It is not a real thread, but it remember one. And is made by repeated lines. Observing a big number of specimens I can related the millefeuille structure (as I called it) with the pseudomorphose of an included tourmaline crystal. 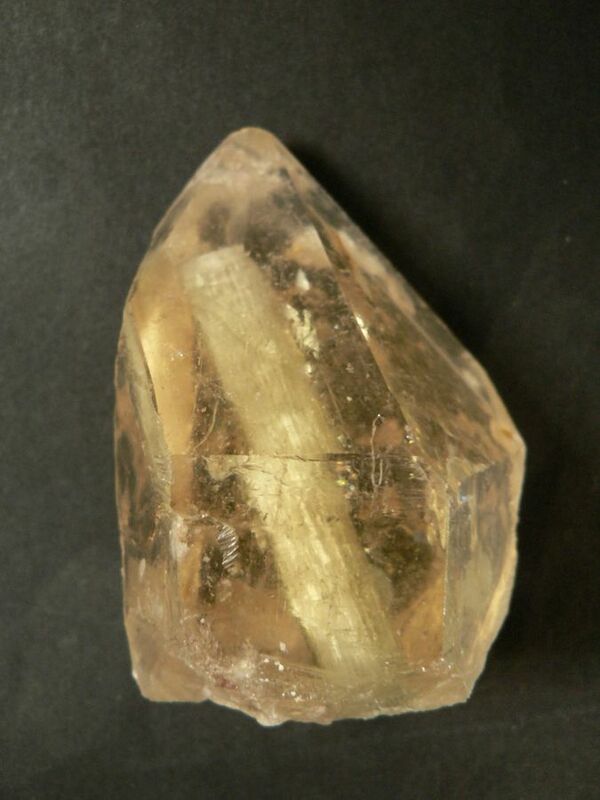 Picture 2 is a less advanced case and picture 3 is a quartz with a true tourmaline inside. In the diagram we have 1) tourmaline crystallizes in a pegmatitic environment of high temperature and high pressure. 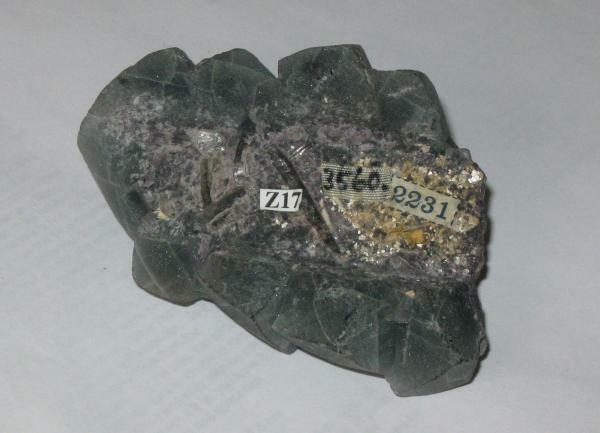 2) tourmaline is altered in hydrothermal high temperature environment. 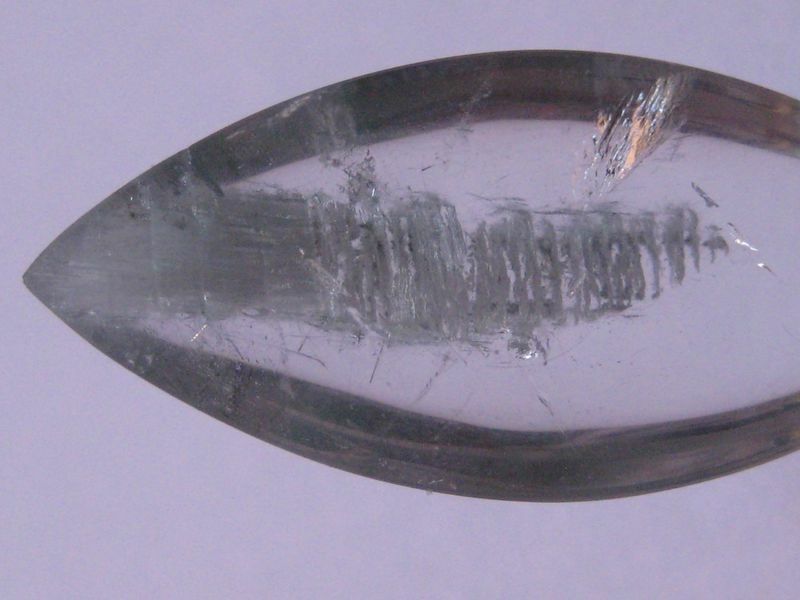 3) tourmaline is the feeding crystal for the overgrowth of an epitactic quartz (the hypothesis is about an epitaxy with constant angle of around 23,5°). 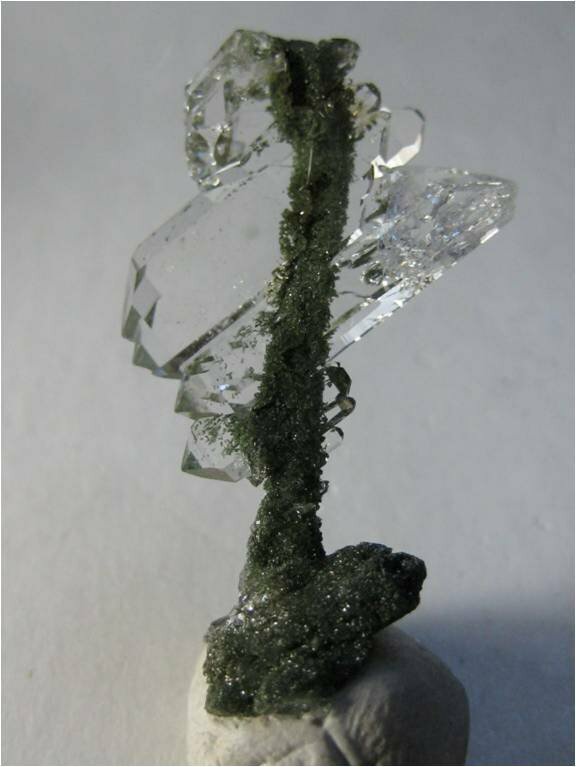 4) included tourmaline is transformed into chlorite or Muscovite (a typical alteration process of the tourmaline) and then into quartz, giving the millefeuille structure. I'm not sure about the physics of all the steps of the process, but there are many evidences that the sequence is as described. The included tourmaline crystal has been analyzed and no tourmaline remain, being the tourmaline completely replaced by quartz. Excuse me for participating in a discussion of such a level, because I am not competent but only curious. However, I wonder if certain factors are not forgotten, like the variation of coefficients of dilation with temperature. They sometimes change sign. This would occur in an anisotropic crystal. Could this not cause cracks? These voids could purify the growing crystal by capturing internal fluids in the hot crystal, as if it was an exsolution. Can we not remember the helical dislocations of beryl? The origin of the Faden quartz. In 1990, I was happy to read Rykart's interpretation. 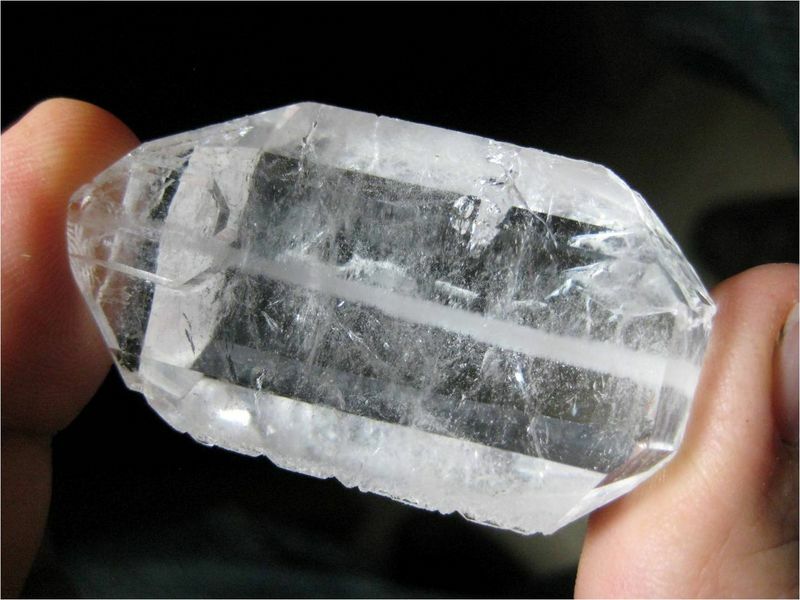 Over time, doubt has been insinuated especially after observing an increasing number of specimens of Faden quartz. Gwindels themselves can have a Faden. I greatly appreciated the theses defended by Pete and Marco, but I do not think they adequately describe the initial situation that will give rise to the Faden quartz. Here is how I conceive the phenomenon. All the Fadenquarz do appear in a vug, which amounts to saying that they crystallize in an almost closed system, as in a box. I have difficulty in conceiving the growth of an initiating filament of the thread in the void of the crevice, or even in a solution. I suggest that this linear ribbon can be sustained in the initial medium. This environment would be a supersaturated gel of non-crystalline silica (in fact polymerized Si(OH)4). This silica gel can withstand temperatures up to 300 ° C without losing water. It is this silica gel environment that I choose as phase that will crystallize. This factor which breaks the metastable equilibrium of the supersaturated gel could be correlated with a sudden as well as brutal retraction initiated by a shock. Under the effect of an adiabatic expansion (rupture of the box), a silica thread does appear suddenly, as if a lightning bolt had crossed the silica gel. This triggering of nano-crystals would be done in a straight line, although curvature effects are possible. The velocity of this primordial crystallization is great, incorporating bubbles of fluids in the blank of small crystal domains. In practice, one would have a series of lattices substantially aligned, since the flash of crystallization would not have allowed a position of equilibrium between all these domains. Then, the normal growth of the crystal (or the crystal sequence) can resume normally, the initial stresses having disappeared. The value of this assumption lies in the fact that the linear ribbon germ is supported by the gel and does not float in a vacuum. This environmental context being proposed, we can think of other mechanisms of initiation of crystallization. Thus, the creation of a hydrodynamic cavitation makes it possible to cause nucleation and the direct production of crystals. This cavitation could be caused by the sudden drop in pressure, by a wave or by any impurity which strikes the supersaturated silica gel. Let us not forget also that the collapse of a vacuum bubble in a liquid creates a strong localized shock wave. The Faden abandons a thread of small cavitation bubbles. Even ultrasounds are likely to initiate crystallization but I do not think they exist in this context. In fact my main hypothesis lies in the nature of the initial medium enclosed in a pocket that opens suddenly. the gel context is exactly what I was thinking when I supposed a chalcedony thread. The polymerization starts from the wall rock in the form of curved chains. Is like an agate, but in a different geological context.